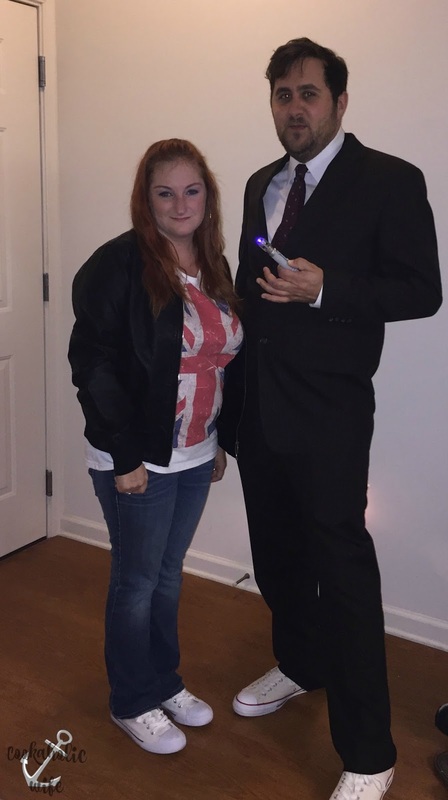 For the Halloween party that we hosted, Tom and I went as the Doctor and Rose from Doctor Who. He had wanted to do this for a while now, so even though Rose is a blonde (and I was blonde for over a decade) I decided to go along with it. I initially planned on wearing a wig but quickly realized that was not at all going to happen. First it was nearly impossible to style and second, it was like wearing a heating pad on my head. No thanks. For the Halloween lunch at work I wanted a different costume because it didn’t make sense to be one half of a couple that wasn’t entirely recognizable on their own. I found a mermaid skirt online and knew Ariel was a great choice. 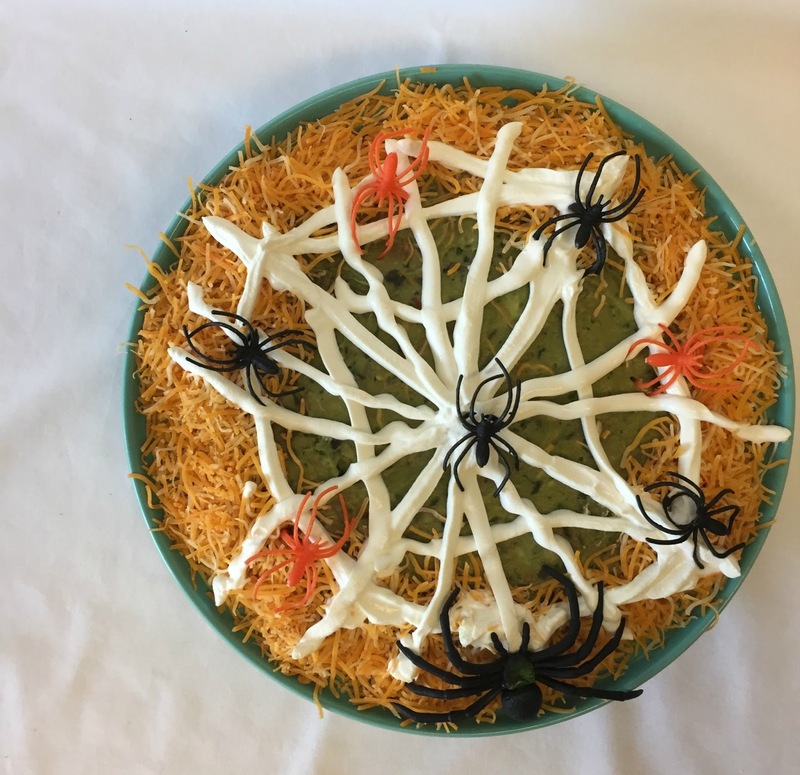 One of the recipes that I made for both parties was this spiderweb seven layer dip. It uses some pretty basic ingredients and is very easy to put together. 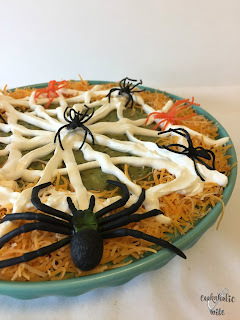 You just layer each ingredient on top of each other and then draw a spider web in sour cream on top. I had found a package of plastic spiders and couldn’t pass up throwing some of them on there as well! This layered taco dip is perfect for Halloween with a sour cream spiderweb and fake spiders. 1. In a medium bowl mash together the refried beans and taco seasoning until combined. 3. Scoop ⅔ cup of sour cream into a zip top bag and set aside. Spread the remainder of the sour cream on top of the refried beans. 4. Spread the drained salsa on top of the sour cream, followed by 1 ½ cups of the shredded cheese, then the guacamole. 5. Cut one corner of the zip top bag off and squeeze the sour cream into a spider web pattern. Use the remaining ½ cup of cheese to spread around the edges, creating a border. 6. Arrange plastic spiders on top. This recipe can be made a few hours in advance and refrigerated. If you let this sit too long, the liquid from the salsa will make this watery. I bought fresh salsa and drained it for an hour before adding it to my dish. If you needed to make some of this the night before, you could assemble until step 3 and then continue the next day.